Long gone are the days when asking for vegan menu options yielded twisted faces and maybe a plate of tomatoes, if you were lucky. Today, vegan cuisine is all the rage, with chefs creating delicious, creative dishes that all diners crave—even omnivorous ones. Here are the best vegan hotspots from Alabama to Wyoming. Golden Temple isn’t just Birmingham’s only exclusively-vegetarian restaurant, it’s also a health food store, yoga studio, and crystal shop (score). Order the Golden Temple Stack—a burrito bowl packed high with brown rice, black beans, vegan cheese, and guacamole—for a filling lunch. This all-day breakfast and lunch spot in Anchorage serves patrons with all diets, but puts special emphasis on its vegetarian and vegan customers—a definite win in a state known for its wild game and fresh fish. Their “Veggie Bypass” includes hash browns, red onion, mushroom, tomato, and is cooked without butter. This cute and cozy vegan and vegetarian café sports a full coffee bar plus an all-day menu of breakfast, savory dishes, tacos, chilis, sandwiches, and cocktails. Spring for the hearty breakfast burrito, made with red potatoes, black beans, spinach, red onions, and tofu, topped with a cilantro lime dressing and wrapped in a flour tortilla. Next time you’re rolling through Little Rock, make sure to stop by Meredith Coleman’s, AKA Meme’s, to sample some of her comfort foods created from locally sourced ingredients (they come from either Coleman’s own garden, nearby farms, or the local co-op). Just make sure to save room for a slow cooked BBQ jackfruit taco—or two! Narrowing down the vegan-friendly spots in California was no easy feat—there are seemingly endless options from San Francisco to San Diego. Gracias Madre in Los Angeles steals my heart for its stunning garden-oriented decor, earth-centered approach to cooking, and delicious, organic, and plant-based Mexican menu. Try their enchiladas verdes: tomato, avocado, zucchini, potato, cashew crema, and black beans (*chef kiss*). WaterCourse Foods has been serving vegan comfort food to its community since 1998 and remains a favorite among all plant-based eaters in the state. Their weekend brunch is super popular (hello, $7 mimosas), and diners love their fluffy buckwheat pancakes with a choice of chocolate chips, berries and cream, or banana and walnuts. Nutmeggers love ION for its large menu, tasty, from-scratch vegan cooking, and its sumptuous cakes (yep, they’re dairy free). Gluten-free diners will also find plenty to love here, including the white clam pasta (with royal trumpet mushrooms and cashew parmesean). Finish your meal with a shot of immune-boosting fire cider. One of Delaware’s only vegan and vegetarian-friendly outposts, Drop Squad Kitchen is a homey yet contemporary café known for its falafel burgers and meatless soul food dishes (yep, vegan ribs and mac and cheese). If you’re planning an event, Drop Squad Kitchen also offers full-service catering. 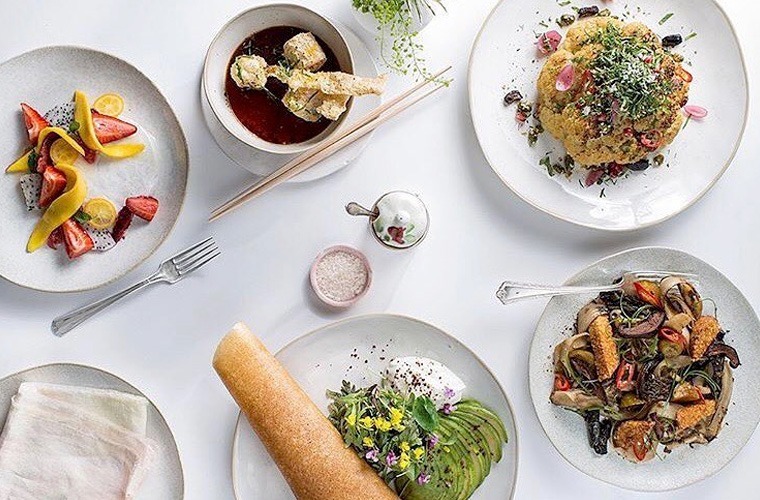 When you’ve finished gallery hopping through Wynwood Art District, head over to Plant Miami for organic, seasonal dishes from Executive Chef Horacio Rivadero. All the produce for this high-vibe hotspot is grown at its sister property, Paradise Farm. Herban Fix is a modern, chic restaurant in Atlanta serving Southeast Asian-fusion dishes by chef Wendy Chang, who moved to Atlanta from her native Taiwan when she was 17 years old. Her savory grilled eggplant with basil and garlic is a crowd favorite, and all her dumplings are handmade from scratch. Hawaiian food across the board is known for using delicious fresh ingredients, but ‘Ai Love Nalo takes plant-based Hawaiian food to the next level. Order the Kaukau Lū’au bowl, which combines Okinawan sweet potato, taro, breadfruit, and coconut sauce with your choice of poi, brown rice, millet, or tofu poke and fresh greens. And save room for dessert—the soft-serve (made from bananas and coconut milk) covered in a cacao “magic shell” sauce is the stuff Hawaiian dreams are made of. The name pretty much explains the level of devotion this barbecue spot has for all things fire grilled and slathered in a generous helping of owner Brad Taylor’s family secret sauce. And while this smoke joint caters to both carnivores and plant-based patrons alike, it’s gained a reputation for its vegan options like potato salad, mac ‘n’ cheese, and smoked tempeh sandwiches. This entirely plant-based mini-chain first opened in Palm Springs, CA, in 1994, and now has eight locations, including one in the Windy Cindy. With sustainability built into its core mission, the restaurant features lighting fixtures made from recycled cardboard and reclaimed oak tables. Originally nestled in the City Market, Three Carrots, now has a second location in Fountain Square. If you can resist the call of avocado toast, try the seitan—it’s made in-house. With a tagline like, “we’re here to make you feel better,” it’s hard to go wrong. Trumpet Blossom Café is an organic, plant-based restaurant that serves seriously beautiful and delicious dishes. Responding to what it calls a “lack of upscale vegetarian dining” options, Roots opened in Louisville alongside its sister restaurant, Heart & Soy. Dine on a number of Asian-fusion treats while sipping on something from the extensive tea menu. Seed is a light, bright, and breezy café serving up garden-based versions of New Orleans favorites, like the gumbo with traditional roux, okra, green and red peppers, collard greens, mushrooms, and seitan. Chase’s Daily is a market, bakery, and restaurant in Belfast that serves a plant-based dinner once a week—the only time dinner service is offered (lunch is served daily). If you can’t score a dinner res (which, frankly, is worth planning your trip around) you can still stop by their flower shop for some gorgeous local blooms. Housed in the American Visionary Arts Museum, this restaurant serves all diets but has many special options for vegan eaters. The menu changes regularly but you can bet that whatever is served, it’ll be fresh, local, and totally Insta-worthy. With a slew of quality options throughout Massachusetts, Forage in Cambridge stands out for being a farm-driven fine dining restaurant with an entirely separate vegan tasting menu for a reasonable $40—go big and add a pairing of organic and biodynamic wines for $25; it’s well worth the price. A trip to Detroit isn’t complete without soul food, and Detroit Vegan Soul offers the first plant-based soul fool experience in the city. Make sure you try the hush puppies, okra stew, and soul platter with mac-n-cheese, cornbread, shiitake mushrooms, maple-glazed yams, and hoppin’ johns. J. Selby’s is not only entirely plant-based, it has separate menus for gluten-, soy-, and tree nut-sensitive eaters, too. Their bowls are filling, creative, and delicious, but the burger will make meat lovers double-check they haven’t wandered into a Shake Shack. Veggie-friendly options are few and far between in the Magnolia State, but High Noon Café comes through in a pinch with staple menu items like its Harmony Bowl (steamed broccoli, carrots, cauliﬂower, edamame, and baked tofu served over long grain brown rice with a vegan sesame sauce) and monthly plant-based potluck lunches. California’s favorite vegan mini-chain, Café Gratitude, has multiple locations in Los Angeles and San Diego. Lesser-known is its outpost in Kansas City, which serves some of Missouri’s best vegan food. Get the Humble, a curry bowl that pays homage to Indian cuisine’s strong vegan tradition. Self-proclaimed as one of “Montana’s natural wonders,” the pull-no-punches Good Food Store is a vegan-friendly market with a variety of delicious prepared foods for the health- and plant-minded. Those looking for a break from the excesses of Vegas will find it at Go Vegan Café, a homey restaurant off the strip. Diners can choose from chia pudding to (gluten-free) pizza to raw burgers. You won’t leave hungry—I’d put money on it. Enjoy sandwiches, salads, wraps, and more at this vegan restaurant in New Hampshire’s capital. Patrons come for the seasonal specials ( like summer rolls with carrots, lettuce, vermicelli, and peanut sauce) but stay to hang with the café’s tail-wagging mascot, Kuma. You can choose between smoothies, brunch faves (like the BLT omelette, made with coconut bacon and cashew cheese), bowls, and more at this organic vegan café. Just looking for a quick sip-me-up? Try the matcha or turmeric lattes, which feature steamed coconut cream and agave nectar. This seasonal, farm-to-table nook serves a two-course prix fix lunch cooked up by one woman, Olive Tyrrell. Pro tip: The menu (which changes daily) isn’t exclusively vegan, so you’ll want to call ahead to see what Olive has in store. Asheville is a mountain oasis with great restaurants, craft beer, tons of art, and a slew of outdoor activities. Plant is known to be one of the best vegan restaurants in the state, offering up both savory and sweet delicacies. North Dakota’s only fully vegan restaurant offers up a slate of soups, sandwiches, and smoothies as well as more, shall we say, creative options, like a glazed doughnut cheeseburger. Its desserts—cupcakes, brownies, carrot cake, etc.—are the true crowd-pleasers. Cleveland Vegan is a full-service café, restaurant, bakery, and catering service that’s been open since 2014. Try their crispy tofu tacos with sriracha lime slaw, pineapple salsa, avocado, and radish. What used to be just a truck has grown into a brick and mortar for Oklahoma City’s The Loaded Bowl. They serve—unsurprisingly—deliciously loaded veggie and grain bowls. Ask any vegan in Oregon what the best restaurant is, and all signs point to Farm Spirit in Portland. With a modern, finer dining approach, Farm Spirit creates one-of-a-kind dishes using Pacific Northwest ingredients. The experience—described on the website as “part show and part communal dinner party”—is tasting menu-only. Apteka serves all-vegan Eastern European-inspired food, a nod to the city’s immigrant past. First-timers to the restaurant or Eastern European dishes need to sample the pierogi plate. Wildflour specializes in vegan baked goods, cold pressed juices, coffee, and lunch options. Don’t leave without a cupcake in hand. Sanaa’s Gourmet is a home -cooking temple to gluten-free and vegetarian Mediterranean cooking, with ample vegan options. Don’t miss the eggplant mosakaa. East Nashville’s The Wild Cow makes everything in-house, including baked goods, stocks, sauces and anything else you can imagine (oh hi, vegan queso). They also have a rotating charity of the month, which receives 2.5 percent of all Thursday sales. Texas’ first vegan gastropub is Beer Plant, in Austin, which combines craft beer, wine, and cocktails with plant-based food. Word on the street is that buffalo cauliflower and blackened broccoli go great with hops and malt. Zest in downtown Salt Lake City serves vegan, vegetarian, and gluten-free dishes in a smartly designed industrial space. This 21-and-over restaurant also serves not-to-be-missed cocktails, like the high zest whiskey sour (hold the egg white, natch). Fresca on Addison is a father-daughter-run café that specializes in local, fresh, organic, and meatless food. Fans flock there especially for the sandwiches and brick oven pizzas. Washington’s Plum restaurant group has five outposts across the state, including a food truck. The section of its Seattle restaurant Plum Bistro dedicated entirely to burgers (served with russet fries) helps it stand out from the competition. Sugar Plum Sweet Shop, located just a few streets down, will satisfy your sweet tooth with its selection of vegan ice creams, custards, sorbets, and baked goods. Founder and owner Elizabeth Petty was introduced to a raw vegan diet when she was diagnosed with breast cancer. Now, she and Executive Chef Francisco Hernandez share that passion for clean food with diners every Friday night with a tasting menu served in a Federalist-era townhouse in downtown D.C. Serving an omnivorous menu that takes care to be friendly to plant-based eaters, Bluegrass Kitchen serves modern food sourced exclusively from West Virginia and the Appalachian Mountains in its restored 1920s-era dining room. Riverwest Co-op Café (which is attached to a grocery store) proudly proclaims on its site: “When we say ‘vegan,’ we mean it.” And since you might as well be contractually obligated to sample some cheese while in Wisconsin—even if you’re vegan—Riverwest offers up a dairy-free quesadilla, grilled cheese, and tuna melt. Sweet Melissa’s tagline is “serving comfort food for the homesick vegetarian since 1999.” Locals love the lentil walnut burger, vegan peanut butter pie, and daily specials. Prefer to cook your vegan fare at home? These are the top 10 vegan cookbooks on Amazon. And did you know that a plant-based diet could help reduce your risk of diabetes? This story was originally published on September 11, 2017; it was updated on June 25, 2018.